Here is a surgical excision of a small mass from the thyroid gland that has been cut in half. A rim of slightly darker rim normal surrounding thyroid parenchyma is seen at the left. The mass is well-circumscribed. On physical examination it felt firm. By scintigraphic scan it was "cold." 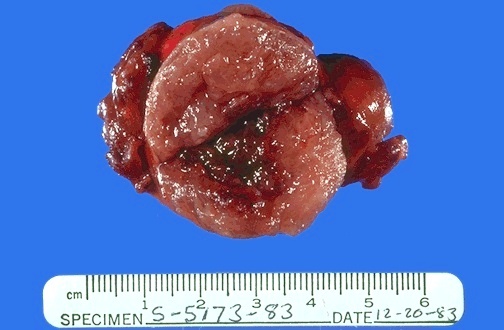 This is a follicular adenoma.